These properties have nice grassy front yards, and a front porch just perfect for sitting outside and relaxing. The back area is mostly used for parking, but there is some room for private gardening or pets to do their business. These duplexes were built in the 1940’s, so the plan offers simple, square rooms. Some units have an updated kitchen with a dishwasher and a garbage disposal, and some have the original 1940’s kitchen. Both options have a large pantry to help offset the limited cabinet space. 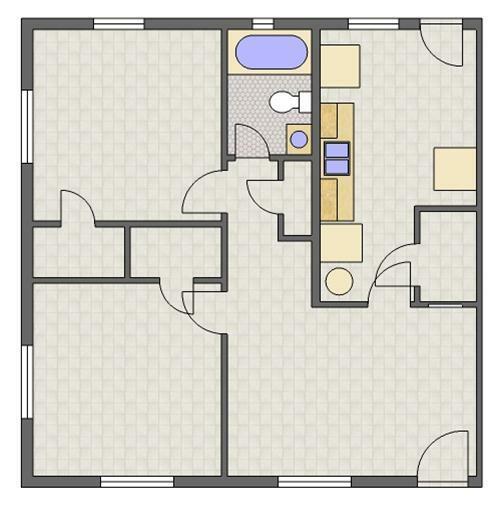 Both bedrooms are similarly sized and offer a mini-walk-in closet, which was a big deal in the 1940’s. The bedrooms and living room have lots of large windows making them very bright. The Columns is located and 1.44 miles from Auburn University. The property has a Walkscore of 62, so you might need to drive or bike some of the time. The Columns has many shops nearby. Coffee shops in the area include Panera Bread, Naruto Cafe, Toomers Coffee Shop. There are a number of markets in the area include Kroger, Walmart Supercenter, Earth Fare.